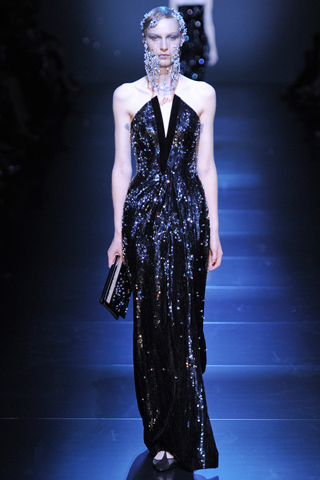 Paris couture week for A/W’12 has been the hotbed for a discussion on what is and isn’t couture. Should couture really be wearable? Or, should these pieces be the fantasy art that is the domain of the super rich who flaunt it and the hours of painstaking, hand sewn embroidery and beadwork in the faces of ‘us’, the ready to wear rabble. It’s not only the collections but the staging that has been criticised. 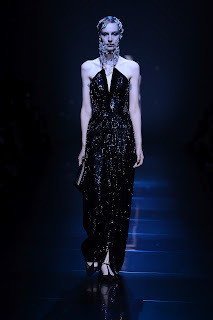 The cri de couer has been couture fashion should be theatre (and hell, I’m all for that) but when the theatre (cue trains, carousels and automobiles as accoutrements) out stars the collection, then there’s a dilemma indeedy. Take Mr Armani. Here’s the man with the multi-billion dollar business who plays to his strengths in his supremely cut tailoring (and even his insistence on the doubling up of catwalk models on the runway, which has long run thin to the jaded front rowers), his muted good-taste tones and his ability to say, ‘Who cares? Take it or leave it. Plenty will buy.’ As we all know, Armani has his cult like devotees who rely on ‘il maestro’ to under gild the lily. Prive by Giorgio Armani was a weighty collection that told the story of a whole day, as Armani women like to keep it constant and in style. The collection was thus divided into the various moments of the day: from the morning, featuring delicate and pastel hues, slowly shifting to the colours of sunset, with prints recreating red and blue skies typical of the moment the sun sets. And then the night, with black dresses marvellously embroidered with rhinestones, and trousers, both in velvet and heavy silk, in tones raging from blue to pink to soft green. The common thread of the show: the lightweight tulle nets as veils that fell over the models’ faces became increasingly precious as the show moved into the night. Still, this was (as they say in football) a game of two halves. 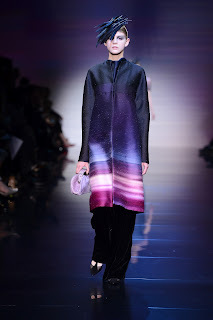 Armani emphasised his empire of the jacket and pants routine in various guises and subtle tones while the latter part of the show focused on the red carpet dress, and plenty of them in velvet or embroidered silks and using the night sky as a focus – blues, blacks and silver sprinkled stardust. 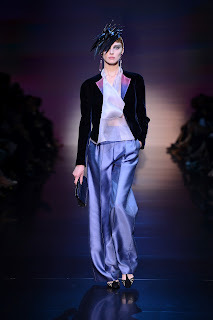 This Giorgio Armani Privé collection displayed a fine balance of opposites encompassing the masculine and feminine – Armani’s unmistakable Italian signature.